One of the oldest early music groups in the United States! Get a copy of our new CD with holiday music! Get all the information! Click on the CDs BY ABC button, above. 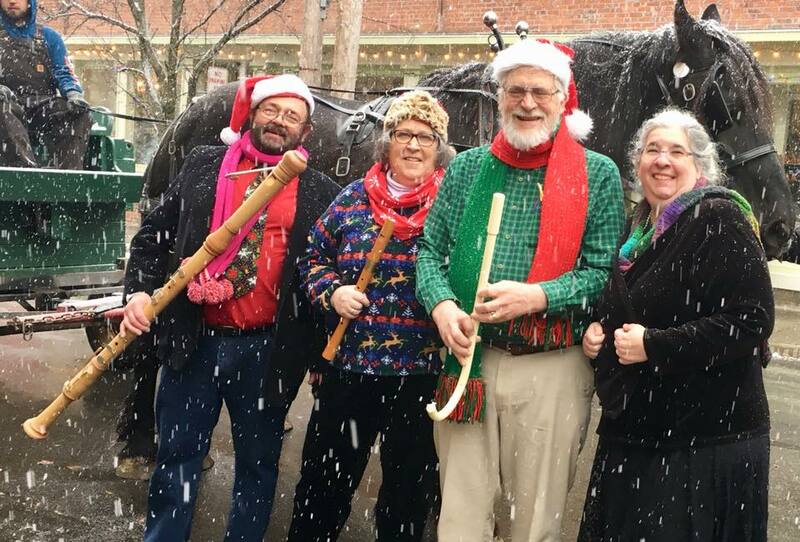 At a 2014 board meeting, the Adirondack Baroque Consort, an early music group based in the Capital Region of New York State, broadened the eligibility requirements for recorder scholarships/grants. The ABC (as it is known) is a 501 (c) (3) not-for-profit early music educational ensemble founded in 1962. The ABC underwrites the scholarship/grant program. Funds are awarded yearly by the Adirondack Baroque Consort. Eligible are teachers and students in local colleges and local elementary and secondary schools. Any person involved in teaching recorder may apply for a grant; this includes music teachers and faculty of colleges, universities and conservatories and teachers and professionals who give private recorder lessons and/or coach recorder ensembles in music schools, home studios, or other locations. Grant applications must be received or postmarked by Tuesday, December 3, 2019. Awards will be announced during January 2020. Applicants must submit to the ABC a written proposal which includes the name, date and place of the event; the amount requested; and a brief statement of the applicant's musical background and experience. Grant recipients are expected to make a written report to the ABC by the end of the calendar year in which the grant is awarded. From its inception, the William & Jane Coffey Regional Recorder Scholarship was administered through the Hudson-Mohawk Chapter of the American Recorder Society. As of 1 January 2015, the scholarship/grant program is administered directly by the Adirondack Baroque Consort. Contact the Consort for questions or clarifications. Our goal is to make music! we strive to make that music come alive! The Adirondack Baroque Consort (known as the ABC) was formed over fifty years ago in 1962 by the late Dr. Maurice C. Whitney, who was Director of Music for the Glens Falls City Schools. The ABC has an active schedule of concertizing and musical lectures at historic houses, schools, colleges, libraries, churches, senior residences and organizational gatherings. Among the venues in the Albany area are the Troy Music Hall, Saint Paul’s of Troy, the "Tuesdays at Noon" Concert series, the Medieval Fair at Albany's All Saints Cathedral, Schuyler Mansion, East Greenbush Library, and "First Night" celebrations in Albany and Saratoga. The group also performs at weddings and special events where early music is appropriate. 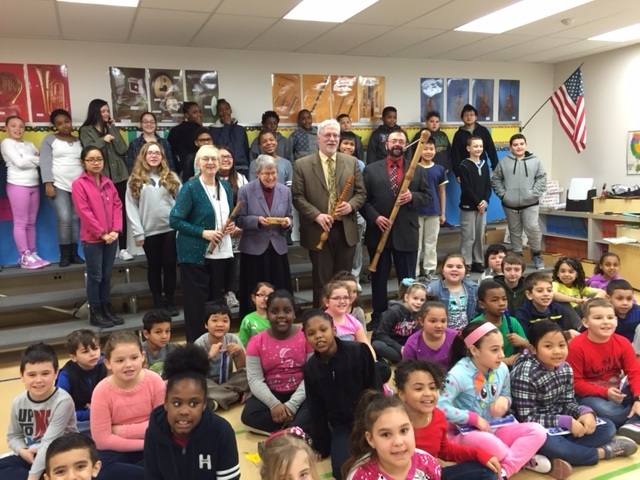 Following a concert, ABC with students of Albany Street Elementary School, Utica, New York. ​Laura Lane, Assoc. Dir., Martha Lepow, MD, James Oppenheimer, Joseph Loux, Artistic Director. ABC regularly presents programs of medieval to modern music played on instruments such as recorders, krummhorns, viola da gamba, violin, Glastonbury pipe, keyboard and various percussion. To view our events for this year, please click HERE. ABC is a registered 501(c)(3) non-profit organization; all the artists volunteer their time and talent. Contributions to the Adirondack Baroque Consort are tax deductible. All proceeds go to support the ABC's two scholarship programs for assisting music students of early music, and to purchase music. To learn more about the ABC's two scholarship programs, please click HERE. To learn more about supporting the ABC through a donation, please click HERE. To learn more about purchasing one of our CDs, please click HERE. The Consort celebrated its 50th Anniversary in 2012, and hosted a celebratory banquet on October 7th, 2012. To view pictures of the Banquet, please Click HERE.